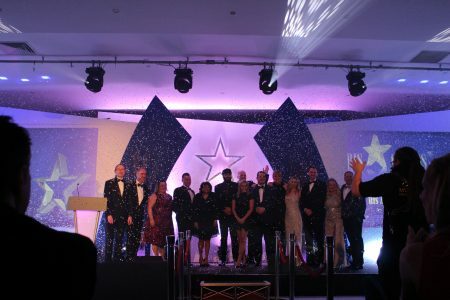 We recently delivered the Randstad awards evening at the Hinckley Island Hotel for the second consecutive year! 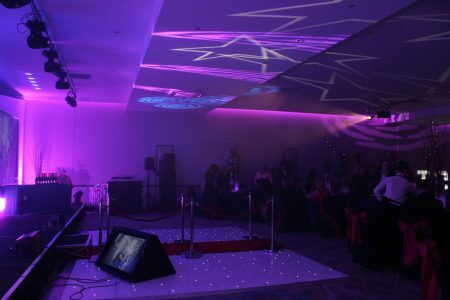 The planning and design of this event has been on-going since last year’s awards evening finished. Throughout the planning process we presented our clients with a wide variety of different designs and themes to give them as many options as possible. 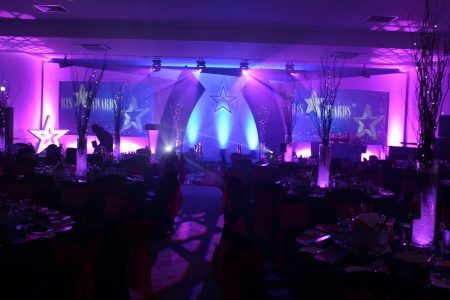 On the day of the event we were tasked with transforming the Paris Suite at the Hinckley Island Hotel into a visually appealing awards ceremony within 2 hours. 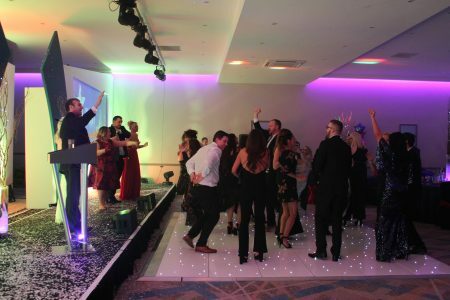 Our team started off by laying our 16ft x 12ft white starlit dance floor at the side of the stage, on top of the dance floor we positioned our VIP chrome posts and red velvet ropes in line with the stage entrance to allow the lucky award winners to collect their prize in style. Once this was complete, the rest of the team prepared the bespoke table centres and floor decorations, this included filling our cylinder vases with crushed clear gel beads and adding our tall willow branches decorated with fairy lights to create a magical effect. Table centres were placed on all the main tables on top of our navy table cloths and also the awards table in the centre of the stage. Our 8ft floor decorations were placed both at the VIP entrance of the Paris Suite and either side of the stage to give the room an enchanted feel. 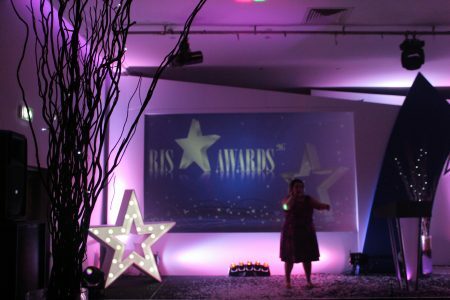 To brighten up the stage our team added our 4ft LED star which worked brilliantly with the RIS awards logo which was designed for this event. 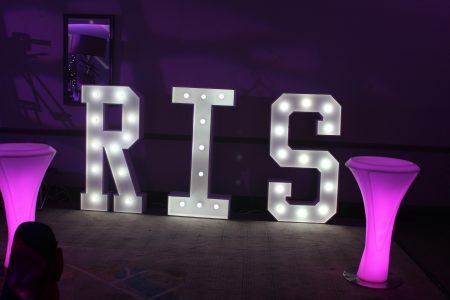 We also created a chilled out corner of the room where we placed our 5ft light up RIS letters and our LED poseur tables where guests could place their drinks and socialise. For the finale of the awards ceremony all the winners were invited back onto the stage for photo opportunities, which is when we showered the stage in confetti from our funfetti shot machines. Once all the awards and prizes were given out it was time for the party to really start. Our team removed our VIP posts and ropes from the dance floor to allow the guests some room to dance the night away and we bought our magic selfie mirror into the room. 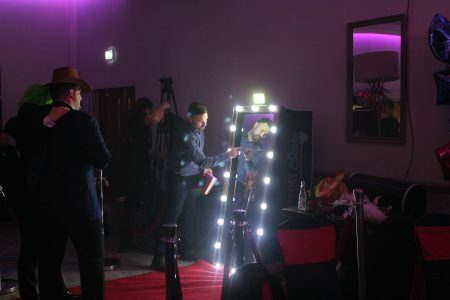 A modern-day take on the classic photo booth our magic selfie mirror was very popular with all the guests who were looking to take some quirky memories away from the event! What a fantastic evening! 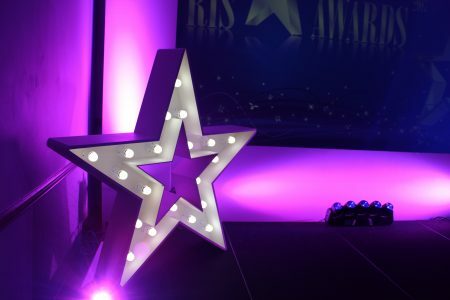 It was amazing to manage event with so many smiling faces and at the end of night we recieved some lovely feedback from both the organisers and guests, we now look forward to organising the Randstad awards for 2019! About to start an event like RIS Awards?